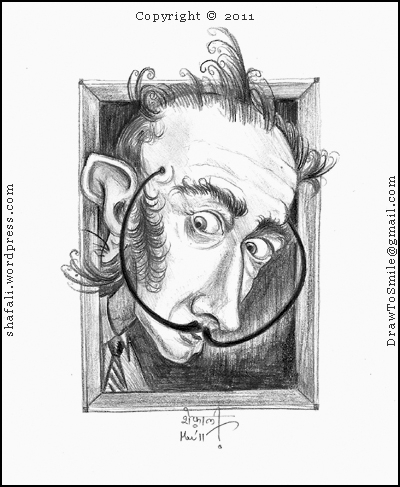 Caricature/Cartoon – Salvador Dali, The Surreal Surrealist & The Persistence of Memory! The Caricature of Salvador Dali – The Surreal Caricaturist and A Psychologist Extraordinaire! I cross my heart and speak the truth so help me Dali. I didn’t draw this caricature, you did…I merely reproduced it. Had you fooled, Didn't I? You see..."The only difference between me and a madman is that I am not mad!" Dali is my Guru of the future. He is the artist whose footsteps I’d love to follow. He is the man who makes me understand the force that drives the loaded ones to part with their money. I like the man, and if someone would promise not to read this post, I’d venture further to say that I love him, mustaches and all. Salvador Dali was born in Catalonia, Spain. That Dali became a surrealist should come as no surprise to us as his parents made him believe that he was a reincarnation of his older brother, also called Salvador. No wonder he grew up with his realities mixed up. Anyway, the point is that his aberrations became clear from the very beginning as the reincarnated Salvador began to display artistic tendencies at a very tender age. Dali’s mom was keen on her son following his artistic instincts. Unfortunately in 1921, when Dali was just 17, she died. Dali worked in Spain until 1935, when he moved to America. He later returned to Spain in 1949 and spent his remaining years there. It is said when Dali was in his late seventies, his Russian wife who was 10 years his senior had gone senile and she fed Dali something that made Dali lose his ability to paint. Still Dali loved her and when Gala his wife died in 1982, he attempted suicide. He was saved by his “friends” (who possibly asked him to sign blank canvasses before his death.) In 1989, when Dali was 86, he finally crossed over into the world of his paintings! In 1922, an 18-year-old Dali who was thinner than a stick, discovered the essence of being a great artist. He developed a persona that would convert Dali himself into a master-piece. He used to dress up in a style fashionable about half-a-century before his time, and a young barely-out-of-his-teens Dali was already beginning to push his eyes out of their sockets. What I really find interesting is the fact that Salvador Dali was kicked out from his art-school because he felt that none of the teachers were competent enough to examine him. I don’t blame him for stating the obvious, but I do think that calling a spade a spade works when the spade is NOT supposed to grade your performance – I think he should have done it after having completed his studies, but then, knowing Dali, he might have done it to ignite controversy – and cook his daily breakfast. Dali’s iconic mustaches made their first appearance in the late 1920s and then they clung to his face throughout his life. That is the problem with developing a persona – you’ve got to stick with the good and bad of it throughout your life. Quite like every other male artist’s father, Dali’s father never approved of his artistic pursuits – especially his hobnobbing with the surrealists. So around 1930 Dali was thrown out of his father’s house, because he said something about spitting on his mom’s portrait, which of course, didn’t go down well with his dad. On one hand Dali was evicted from his dad’s house for getting chummy with the surrealists, on the other hand he was expelled from the surrealist group because he didn’t want to take a pro-communist, anti-fascist stance that all the other surrealists were taking at the time. However, Dali wasn’t worried at all. He twirled his sword-fish mustaches, puffed his chest up, and said, “I myself am surrealism.” Point taken, Mr. Dali. Salvador Dali’s artwork continuously changed in form and method. He began as a painter who was strongly influenced by Pablo Picasso‘s Cubism, Dadaism, and Expressionism. He then moved into surrealism but stayed with painting. Later in his life, he began experimenting with the photographic method and the content of his artwork became more science-oriented. The fact that he was an artist extraordinaire automatically qualifies him for receiving at least one Mental Illness Award. So, what did he suffer from? 1. DSM Cluster A and B? Don’t ask – but Dali’s eccentricities (which incidentally had a big hand in making him famous,) have been ascribed to some sort of mental illness. But then Dali was smart enough to know something that the psychologists didn’t – he knew how to be famous…and he knew that he wasn’t mad. Dali was an exceptionally intelligent, street-smart man, who was also highly skilled in using the brush. Thus, he was unlike other artists. I believe that he could have excelled as a politician, a doctor, an engineer, a photographer, a cook…I guess he could have been whatever he wanted to. He however, wanted to be an artist – and he was smart enough to know how to become famous as an artist. He knew that he had to make Dali a brand in art, and he knew that you didn’t become a famous artist by doing what everyone else did. So he swam against the current, and he made the fact known, even if he had to scream it out in your face. Note that he had begun to develop his persona much before he became renowned for his art. Also note that most of his artworks generated a lot of criticism in terms of multiple interpretations – thus, he was completely aware of the fact that criticism of a certain kind leads to promotion. He ensured that his personality synchronized with his quirky artwork. I’d have grouped him with the likes of Pablo Picasso and M.F. Hussain, but for his skill with the brush. Dali was an artist who could call his brush to do his bidding. Unlike others who have successfully peddled abstract art that made you wonder if your three-year old could do a better job, Dali makes you think that if the artist of his caliber tossed those objects around on the canvas, he must surely have had a reason to do so. I bow to Dali’s smartness, intelligence, and skill – in that order.